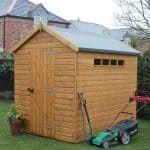 This well sized timber shed and workshop differs from many garden buildings we review in that it has a reverse apex, meaning that it is wider than it is deep. This creates a very pleasing appearance akin to a smaller version of a house, and because the wide opening door is on the longer side it makes it very easy to get in and out and reach all the corners. With the tall ridge of the apex also creating extra space, it creates a surprisingly roomy environment to move around in and to keep goods and equipment. The interior is also pleasant because of the two toughened windows which fill the space with natural light. They can be opened and then fixed into place, thus creating a cool and well ventilated area. That’s why we can imagine this being used for much more than just a storage facility. The roof also helps in the battle against rain, of course, as does the tough high quality cladding, We were glad to see that it had been used throughout, as this makes it very hard for an water to penetrate into the shed itself. For this reason, a long 15 year warranty is provided by the manufacturer against the occurrence of rot. 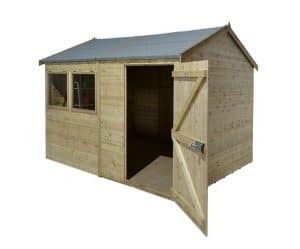 This timber shed takes the traditional apex design and literally gives it a clever twist by placing the gables at the shorter ends, and giving a wide frontage that on this occasion contains the entranceway and two windows. 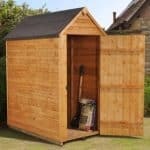 We really liked the impression this reverse apex creates, and it’s sure to be a shed that impresses your neighbours and friends. Despite its orientation, the apex roof still performs the same invaluable function of channelling rainwater away from the shed itself, and its tough mineral felt cover makes it very durable and water resistant. It’s also a tall roof, with a ridge height of 2.54m and an eaves height of 1.95m, so there’s lots of headroom. The overall depth of the shed is 2.44m, and the overall width is 3.02m. Cladding is all important in wooden sheds, so we were impressed that high quality tongue and groove cladding had been used throughout, by which we mean on the roof and floor as well as the walls. 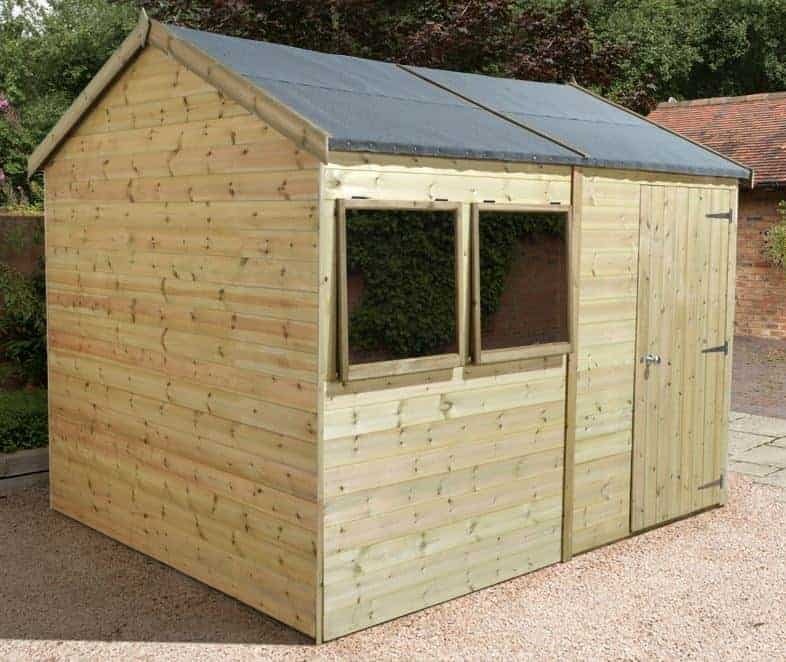 It’s 12mm thick, which is the same as cladding we see on many sheds of this size, but when allied to a frame of 34 X 34mm it creates a strong and stable structure. With the same thickness used for the floor it should be suitable for all but heavy machinery or vehicles such as motorcycles, in which case reinforcement may be necessary. We were pleased to see that it also featured integrated and pressure treated floor joists as these are a major aid in the fight against ground moisture. 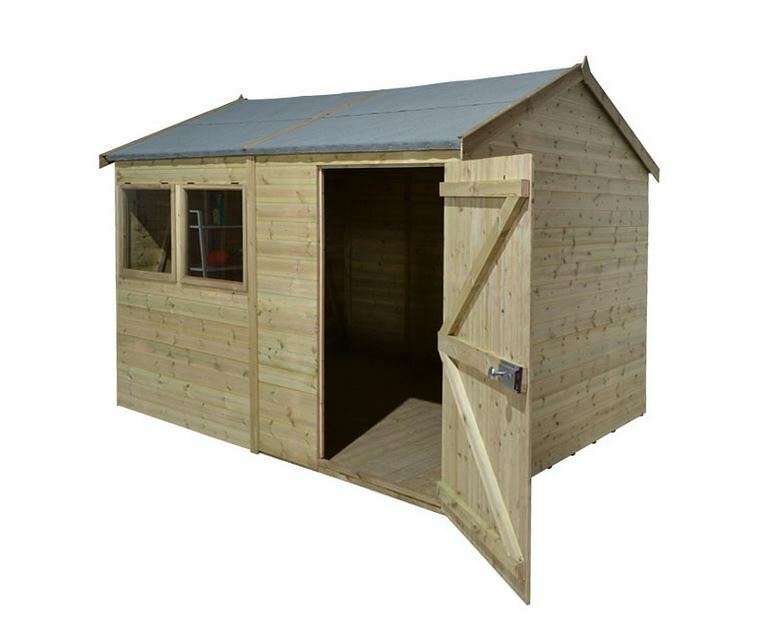 We often review timber sheds in this price range that come with a ten year warranty, and sometimes see sheds that come with only the standard one year warranty, so it was good to find that the manufacturer has here provided a 15 year warranty against rust. 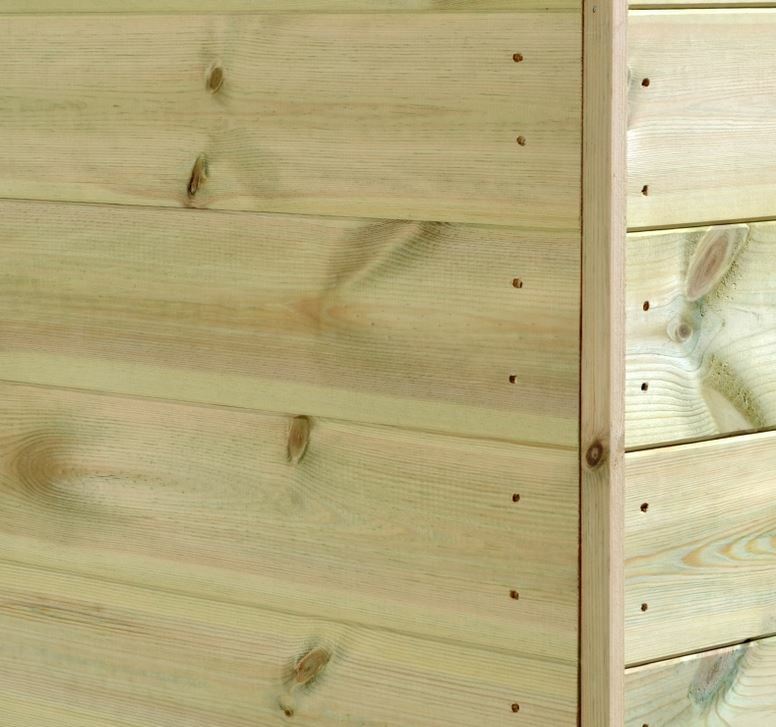 This shows how rain repellent the cladding is, and it also shows how effective the initial pressure treatment applied to the wood is. 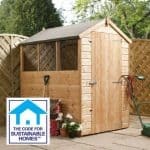 The manufacturer doesn’t state that retreatment has to be carried out during the warranty period, but with all timber sheds we recommend looking at them on a yearly basis and applying more wood preserver if required. As well as the reverse apex roof, the other feature that struck us immediately was the door. For a single hinged door, it’s very accommodating. Indeed, its width of 0.88m is more than some double doors we review and the door height of 1.80m is also generous, so you won’t have to worry about stooping down when going in or out. The two windows were also features that we welcomed. If this is used as a craft workshop, a function for which we think it’s highly suitable, then natural light is a necessity. Sited adjacent to each other, it means that there are still three windowless panels, so the shed can be assembled so that passers by can’t see inside. Even so, we know that some people would have liked the option to adapt this to a completely window-free design. It was good to see that the door was fully braced and that the windows featured toughened glass, as these make it harder for people to gain unauthorised access. 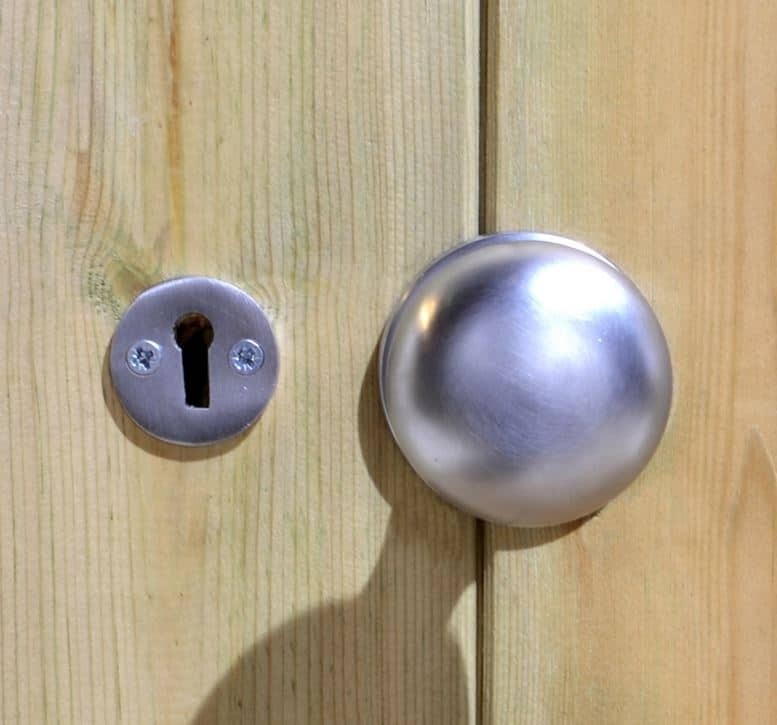 This is also helped by the inclusion of a key operated locking system. 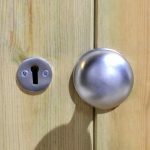 We were very pleased to see this boost to security, as many sheds we review, even ones costing upward of nine hundred pounds, don’t feature any locking system as standard. We liked the standard roof supplied with the shed, but realise that some people prefer a slatted design. Thankfully for them, a slatted roof is available as an optional extra, although it does cost the significant sum of £309.99. Other optional extras available include a strong workbench and a professional installation service, which will come in particularly useful for those who live busy lives or who don’t have the confidence to attempt self-assembly. The use of tongue and groove cladding throughout all the surfaces is just indication of the impressive quality of this shed. 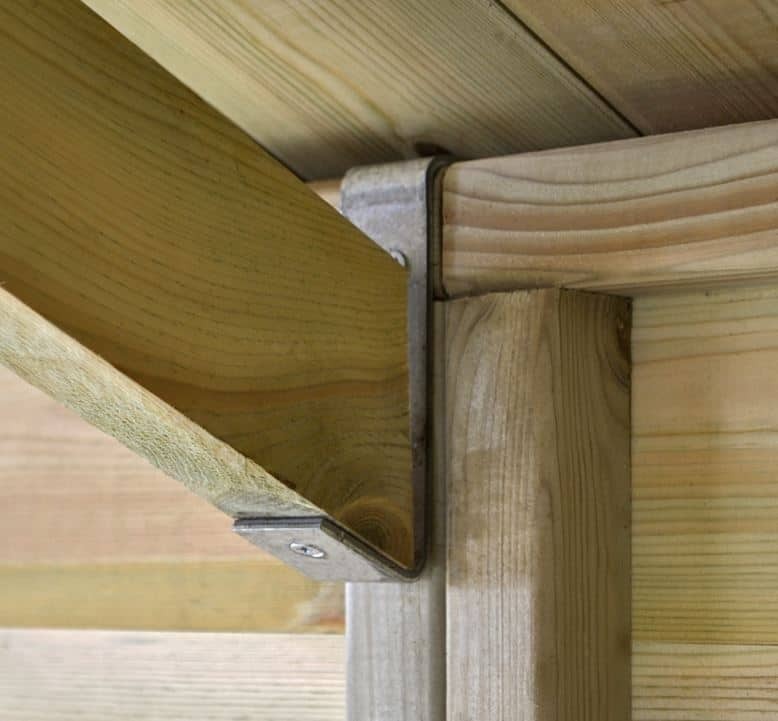 We were impressed that the manufacturer had used pressure treatment for all the timbers, including the floor joists. Combined with the cladding this should result in a very durable shed. 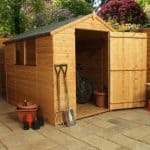 The wide door and wide frontage help the owner make the most of this shed, so it offers a good storage volume. 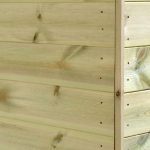 There are lots of components, as we’d expect from a large timber shed, so we can understand why people would opt for the installation service, but two people should be able to assemble it in around five to six hours. 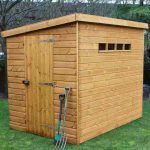 This isn’t the cheapest timber shed, but it comes with a host of features that elevate it above the ordinary, and this provides good value for money. Final Thoughts: This is an impressive shed in many ways, not only in its attractive appearance which mixes the traditional and the contemporary. 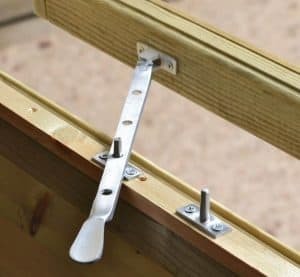 We particularly liked the fact that it includes many elements as standard which are optional extras on other sheds, such as a locking system and pressure treated joists. The latter feature, when combined with the tough cladding, makes this a very water and rot resistant building, so we were pleased that this was backed up by a warranty period of 15 years. 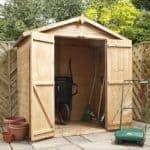 That represents real peace of mind for the customer, whether they plan to use it as a garden storage shed, or a workshop for their hobby or occupation.